Pocket, the “save for later” service that relaunched as a major revamp of Read It Later back in April, is launching today its first official desktop application for OS X. Pocket for OS X is available today for free on the Mac App Store. I’ve been able to test Pocket for Mac during the past week. Michael Schneider, creator of Read Later (nèe Read Now), joined the Pocket team to create the new Mac app; you may remember Read Later as a client for Instapaper/Pocket/Readability articles that we’ve been following here at MacStories since the first version. According to Pocket, the former Read Later app will continue to work for existing users, but it will no longer be supported. 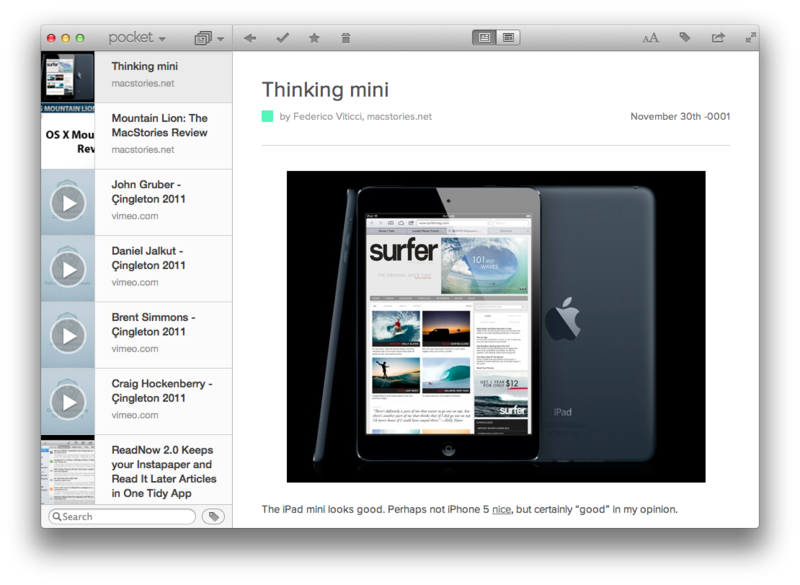 Pocket for Mac is a new app, but it borrows heavily in terms of underlying concept and flow from Read Later. On the left, there’s a sidebar listing articles and videos with thumbnails for visual previews; the actual article (or video) is displayed on the right in a clean, Pocket-formatted view that uses the same parser of the mobile app. I personally find Instapaper’s parser to be slightly more precise than Pocket’s when it comes to long articles, but I also find Pocket way better at parsing content than Readability, especially for embedded videos and images. Pocket shifts the conversation from “read this article later” to “save stuff for later”. The basic mechanics are the same, but the concept is much broader, and easily understandable by average users that may have been scared off by Instapaper’s sole focus on text. Pocket wants to appeal to those people that don’t have time for articles, images, videos, or just about any webpage. It rises from the ashes of Read It Later (which both marketing-wise and functionality-wise was built around articles) to tackle the problem of a lack of time and single place to “save content for later” with a new focus: mainstream. 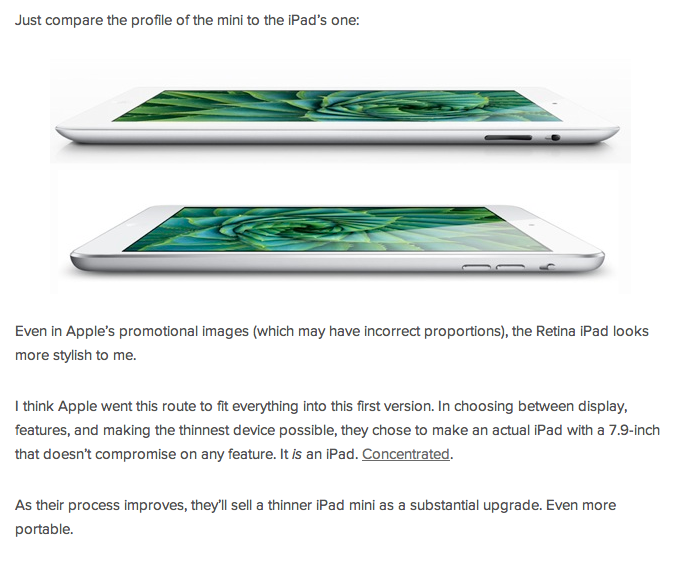 The Mac app follows in the footsteps of the iOS client when it comes to navigation and sharing options. Like Tweetbot for Mac, transitioning from touch-based to point-and-click interaction has allowed the developers to rework some mechanics to take advantage of OS X while still feeling like an app that belongs to the modern era of iOS/OS X software. There are keyboard shortcuts and contextual menus for acting on items: you can Archive, Mark as Favorite, Delete, but also Mail an item, copy it, open it in the browser, or tag it. One shortcut I like is ⌘+S to automatically save a URL from the clipboard. To refresh, Pocket for Mac uses the standard pull-to-refresh gesture, but there’s also a ⌘+R shortcut for keyboard aficionados. Pocket’s article viewer looks nice. It’s clean, but over time I’ve noticed Instapaper’s parser is more precise at correctly grabbing complex articles with lots of headers, captions, or inline quotes – therefore making Instapaper’s article view better for text. Sometimes Pocket doesn't get an article's publishing date right. Pocket’s biggest advantage, and the reason I use it, is that it supports videos. 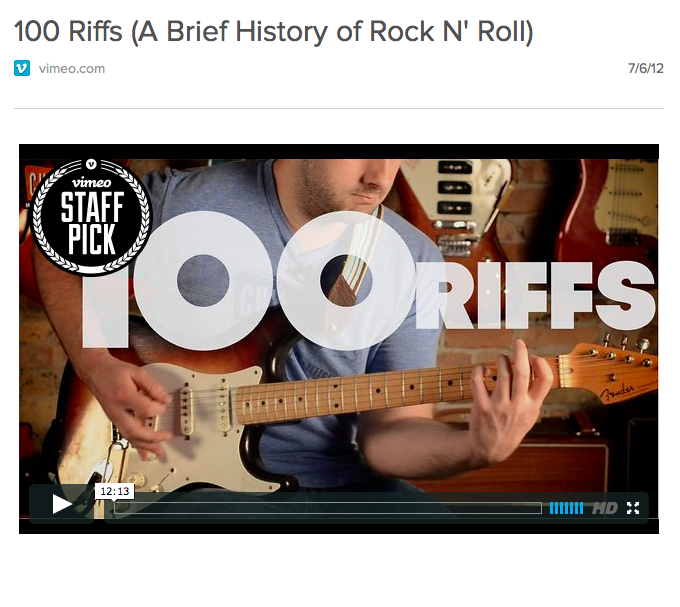 On the Mac, YouTube and Vimeo videos – the ones I’m interested in – are stripped of every extraneous website element and presented for what they are: videos. Furthermore, YouTube videos default to the HTML5 YouTube video file, making Pocket a pleasant experience to sit back and enjoy videos you’ve saved, whenever you want, in full-screen on your Mac. Because it is a Mac app, the Pocket developers are taking advantage of its native nature to support features that OS X users demand from the platform. There is decent support for keyboard shortcuts (just click on the various menubar items to find out); support for OS X full-screen mode; and some nice touches here and there, such as translucent black menus that appear to confirm actions like delete. I also believe that there is a considerable percentage of users who don’t like reading on the iPhone’s smaller screen or maybe don’t have an iPad yet. It would be interesting to analyze Pocket’s userbase and see if it’s made more by “geeks” who own multiple devices, or “casual” users who approached the app tempted by its solid feature set, clean design, and free model. As a service that wants to be everywhere, it makes sense for Pocket to have a native Mac app. As a “power user” of several Mac apps on a daily basis, however, there are some things that I believe a native Pocket for Mac could provide to better differentiate itself from the web and iOS versions. Twitter and Facebook integration should be native on Mountain Lion, as it makes no sense to force users to log into their accounts again when those accounts are already configured in System Preferences. A native Mac app should also take advantage of the platform’s various features dedicated to people who want to get more out of apps. Namely, it’d be nice if Pocket had a URL scheme to quickly save URLs, or support for AppleScript. For the occasion, I’ve prepared an AppleScript that lets you send an item to Pocket quickly. You’ll need to generate an API key for the script, which you can do here; then, change the properties PocUser, PocPass, and PocAPI for your account. The script will simply send a link you have in your clipboard to Pocket; unfortunately, I didn’t have time to insert a check for possible errors returned by Pocket in this first version. do shell script "curl \"https://readitlaterlist.com/v2/add?username=" & PocUser & "&password=" & PocPass & "&apikey=" & PocAPI & "&url=" & apurl & "\""
The script is also easily configurable with Alfred or any other launcher: create an AppleScript extension, choose to run it in the background, perhaps assign a hotkey to it. With a link in your clipboard, press the hotkey and the link will go off to Pocket. As for other suggestions for future Pocket improvements, I’d like to see a system Service or a menubar item to quickly drop links from the browser. 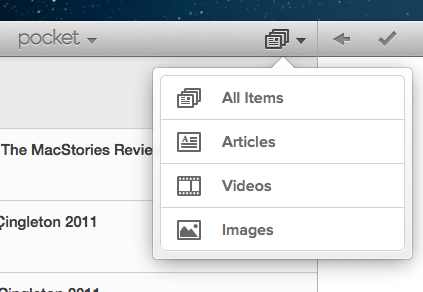 As a Mac app, Pocket could do more, but it’s a good start. If you use Pocket, you should download the Mac app. Get it here.